The events in Matthew 13–15 took place at a time when Jesus Christ and His disciples were facing increasing opposition from many of the Pharisees (see Matthew 12:14; 15:1–20). At this point in the Savior’s public ministry, He began using a teaching method that reached listeners at their individual levels of spirituality﻿—He began to teach in parables (see Mark 4:34). Jesus Christ used the parables found in Matthew 13 to teach truths about the kingdom of heaven, which is the Church, including the eventual Apostasy and latter-day Restoration (see Bible Dictionary, “Kingdom of heaven or kingdom of God,” “Parables”). 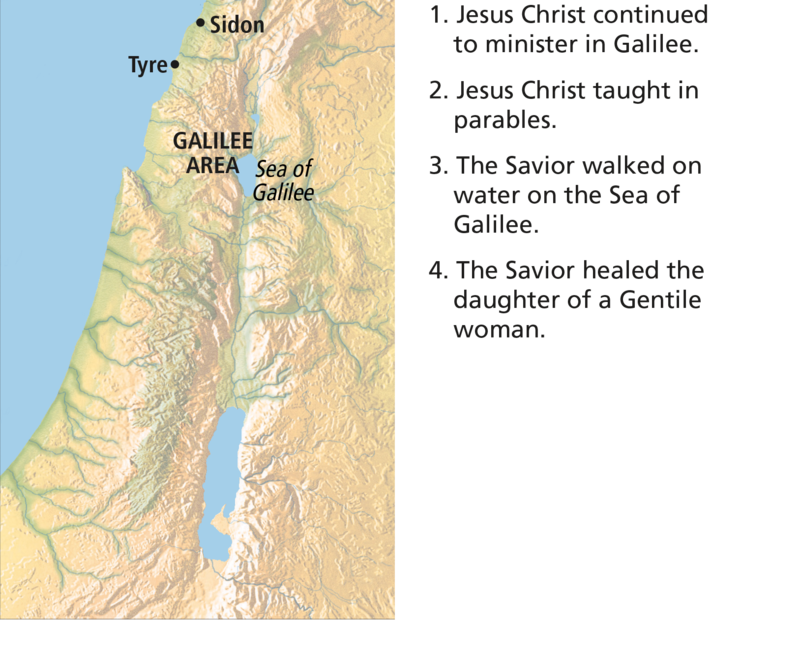 The account in Matthew 14 of Jesus Christ walking on the waters of the Sea of Galilee provides an example of the Savior’s power over the elements. This experience teaches that the Savior, who can walk on water and calm storms, can also lift His disciples and give them peace during storms of opposition. The storm can also be seen as a symbol of the opposition the Lord and His disciples were facing at that time. The Savior’s power to lift and to heal is further illustrated by the healings described in Matthew 15. In chapter 13, Matthew recorded eight parables of the Savior. The word parable means “a comparison” or “a setting side by side” (Bible Dictionary, “Parables”). Each of the eight parables recorded in Matthew 13 compares the “kingdom of heaven” to a physical object or objects. (For a definition of the “kingdom of heaven,” see the commentary for Matthew 13:11.) There are often contextual clues that clarify the interpretation of a parable, such as the audience to whom the parable was directed or the question Jesus was addressing. The Prophet Joseph Smith (1805–44) taught, “I have a key by which I understand the scriptures. I enquire, what was the question which drew out the answer, or caused Jesus to utter the parable? … To ascertain its meaning, we must dig up the root and ascertain what it was that drew the saying out of Jesus” (in History of the Church, 5:261). In some instances the Savior Himself gave the interpretation. For example, Jesus explained the meaning of the parables of the sower and the wheat and the tares (see Matthew 13:3–8, 18–30, 36–43). Although there is normally one intended interpretation of a parable, there may be many lessons and truths from a parable that can be applied to modern circumstances. President Hugh B. Brown (1883–1975) of the First Presidency pointed out that the Savior’s parables most likely developed out of ordinary day-to-day experiences: “His parables were not woven from fancy. They were word pictures of what he had observed as he lived among the people. He had seen the sower at work in the field, the shepherd with his sheep, the repentant son returning to his father, the barren fig tree; he knew the publican and the Pharisee and had attended wedding feasts where foolish virgins had no oil in their lamps. He taught from the richness of his own life, and he taught because he loved the people” ( Eternal Quest, sel. Charles Manley Brown , 181). The Prophet Joseph Smith taught that the Savior’s parables in Matthew 13 help us understand the gathering of people into the Church during New Testament times and also during the latter-day establishment of the gospel on the earth: “The sayings of the Savior, recorded in the 13th chapter of His Gospel according to St. Matthew, … in my mind, afford us as clear an understanding upon the important subject of the gathering, as anything recorded in the Bible” (in History of the Church, 2:264). The following chart summarizes some of the Prophet Joseph Smith’s teachings on the parables of Matthew 13 and shows what they teach about the gathering of Israel and about the marvelous growth and destiny of the kingdom of heaven (the Church) from the days of Jesus Christ through the Millennium. People who hear the preaching of the gospel respond in various ways. Also, the Church was established by Jesus and the Apostles in the meridian of time. “This parable [of the sower] was spoken to demonstrate the effects that are produced by the preaching of the word; and we believe that it has an allusion directly to the commencement, or the setting up, of the Kingdom in that age [New Testament times]” ( Teachings of Presidents of the Church: Joseph Smith , 298–99). The righteous and wicked grew together in New Testament times, eventually leading to the Great Apostasy. In the latter days, they will grow together until the end of the world, when the wicked will be destroyed and the righteous will be gathered in the kingdom of God. “We learn by this parable [of wheat and tares], not only the setting up of the Kingdom in the days of the Savior, which is represented by the good seed, which produced fruit, but also the corruptions of the Church, which are represented by the tares, which were sown by the enemy, which His disciples would fain have plucked up, or cleansed the Church of, if their views had been favored by the Savior. But He, knowing all things, says, Not so. As much as to say, your views are not correct, the Church is in its infancy, and if you take this rash step, you will destroy the wheat, or the Church, with the tares; therefore it is better to let them grow together until the harvest, or the end of the world, which means the destruction of the wicked, which is not yet fulfilled” ( Teachings: Joseph Smith, 299). The Church will be restored in the latter days. “‘The Kingdom of Heaven is like a grain of mustard seed’ [Matthew 13:31–32]. … This figure is given to represent the Church as it shall come forth in the last days. … Let us take the Book of Mormon, which a man took and hid in his field, securing it by his faith, to spring up in the last days, or in due time; let us behold it coming forth out of the ground, which is indeed accounted the least of all seeds, but behold it branching forth, yea, even towering with lofty branches and Godlike majesty, until it, like the mustard seed, becomes the greatest of all herbs. … God is sending down His powers, gifts, and angels to lodge in the branches thereof” ( Teachings: Joseph Smith, 301). The latter-day Church will spread throughout the earth, aided by the leaven of the testimonies of the Three Witnesses and the latter-day scriptures. “‘Then said He unto them, therefore every scribe which is instructed in the Kingdom of Heaven, is like unto a man that is an householder, which bringeth forth out of his treasure things that are new and old’ [Matthew 13:52]. “For the works of this example, see the Book of Mormon coming forth out of the treasure of the heart. Also the covenants given to the Latter-day Saints [the Doctrine and Covenants], also the translation of the Bible—thus bringing forth out of the heart things new and old, thus answering to three measures of meal undergoing the purifying touch by a revelation of Jesus Christ, … which will answer to the leaven which leavened the whole lump” ( Teachings: Joseph Smith, 302–3). The gathering of the righteous. “The Saints work after this pattern [of the hidden treasure]. See the Church of the Latter-day Saints, selling all that they have, and gathering themselves together unto a place that they may purchase for an inheritance, that they may be together and bear each other’s afflictions in the day of calamity. “… See men traveling to find places for Zion and her stakes or remnants, who, when they find the place for Zion, or the pearl of great price, straightway sell that they have, and buy it” (in History of the Church, 2:272). It should be noted that although in the early days of the Church, Saints were encouraged to gather to a common geographical location, like Nauvoo or Salt Lake City, today Church leaders have encouraged us to stay where we are and to build up the Church in our current cities and towns. All types of people will be gathered into the Church. “‘Again, the Kingdom of Heaven is like unto a net that was cast into the sea, and gathered of every kind …’ [Matthew 13:47–48]. For the work of this pattern, behold the seed of Joseph, spreading forth the Gospel net upon the face of the earth, gathering of every kind, that the good may be saved in vessels prepared for that purpose, and the angels will take care of the bad” ( Teachings: Joseph Smith, 303). In the parable of the sower (also called the parable of the soils), the field represents the world, and the sowers represent the Apostles. The different types of soil represent the conditions of people’s hearts. “The word of the kingdom” is “sown in [one’s] heart” (Matthew 13:19), the Savior taught, and the parable describes the various ways in which people respond to the gospel word. The way side was a path or road around or through fields. It became hardened as farmers and travelers regularly walked upon it. The hardness of the way side prevented seeds that fell upon it from sinking into the soil and taking root, allowing birds to easily see and eat them. Stony places were rocky surfaces covered by a thin layer of fertile soil. Though seeds could send forth shallow roots, the rock that lay just below the surface prevented the roots from going deeper, and the plant was unable to withstand the scorching heat of the day. The ground with thorns was fertile soil; however, it was overgrown by thorns and other weeds that crowded out more productive plants by depriving them of water and needed nutrients. The good ground was fertile soil with sufficient depth for healthy roots so the plants could grow and bring forth varying amounts of fruit. We receive more understanding of the meaning of the Lord’s words in Matthew 13:12 from His statement in 2 Nephi 28:30: “Unto him that receiveth I will give more; and from them that shall say, We have enough, from them shall be taken away even that which they have” (see also Joseph Smith Translation, Matthew 13:10–11 [in Matthew 13:12, footnote a]). The Savior’s words in Matthew 13:12 could therefore be taken to mean, “For whosoever hath [a capacity to receive], to him shall be given.” This underscores the importance of individual agency in understanding the gospel. Even an all-powerful God cannot give to someone who will not receive. Another Book of Mormon passage reinforces this principle, teaching that when people continue to harden their hearts against spiritual truth, they may lose the spiritual knowledge they once had (see Alma 12:10–11). The phrase “the kingdom of heaven” occurs eight times in Matthew 13. Elder Bruce R. McConkie (1915–85) of the Quorum of the Twelve Apostles explained that the “kingdom of heaven” as used in Matthew means “the Church and kingdom of God on earth; the Church as formally set up and organized by the Lord Jesus Christ in the meridian of time” ( Doctrinal New Testament Commentary, 3 vols. [1965–73], 1:296; see also Bible Dictionary, “Kingdom of heaven or kingdom of God”). The Savior used parables to hide meaning from those who were spiritually unprepared and to reveal great truths to those who were ready to receive them (see Matthew 13:10–16). “The parable conveys to the hearer religious truth exactly in proportion to his faith and intelligence; to the dull and uninspired it is a mere story, ‘seeing they see not,’ while to the instructed and spiritual it reveals the mysteries or secrets of the kingdom of heaven. Thus it is that the parable exhibits the condition of all true knowledge. Only he who seeks finds” (Bible Dictionary, “Parables”). The Savior’s parables therefore included an implied invitation to seek further understanding of the truths they contained, and those who did so were rewarded with greater enlightenment (see Matthew 13:10, 36). Elder James E. Talmage (1862–1933) of the Quorum of the Twelve Apostles provided a simple illustration showing why some people may fail to understand the truths taught in parables: “Two men may hear the same words; one of them listens in indolence and indifference, the other with active mind intent on learning all that the words can possibly convey; and, having heard, the diligent man goes straightway to do the things commended to him, while the careless one neglects and forgets. The one is wise, the other foolish; the one has heard to his eternal profit, the other to his everlasting condemnation” ( Jesus the Christ, 3rd ed. , 297). Which of the soils in these verses do you think most resembles the Pharisees and scribes described in Matthew 12:22–24, 38–40? “For the seeds of faith to sprout in our lives, we must avoid Satan’s grasp. “We also need to prepare our own seedbeds of faith. To do this we need to plow the soil through daily humble prayer, asking for strength and forgiveness. We need to harrow [break up] the soil by overcoming our feelings of pride. We need to prepare the seedbed by keeping the commandments to the best of our ability” (“Of Seeds and Soils,” Ensign, Nov. 1999, 48). President Henry B. Eyring of the First Presidency taught that studying the word of God can open our hearts to spiritual things: “The word of God is the doctrine taught by Jesus Christ and by His prophets. Alma knew that words of doctrine had great power. They can open the minds of people to see spiritual things not visible to the natural eye. And they can open the heart to feelings of the love of God and a love for truth” (“The Power of Teaching Doctrine,” Ensign, May 1999, 73). “The word [tares] denotes darnel grass, a poisonous weed, which, until it comes into ear, is similar in appearance to wheat” (Bible Dictionary, “Tares”). The Savior explained that the gathering and burning of the tares represented the destruction of the wicked at the end of this world (see Matthew 13:38–42). President Marion G. Romney (1897–1988) of the First Presidency stated: “The tempo of wickedness and destruction has been greatly accelerated … , and so has the gathering in of the wheat. Even now the tares are binding themselves in bundles, making ready for the field to be burned” (in Conference Report, Oct. 1966, 53). In addition to the explanation of this parable that the Lord gave in Matthew 13:36–43, He gave further explanation in Doctrine and Covenants 86:1–7, clarifying how the parable applies to the Apostasy, the Restoration, and the end of the world. The Lord also stated that the gathering of the wheat is taking place in this dispensation, and the burning of the tares will occur at His triumphal return (see D&C 101:63–68). 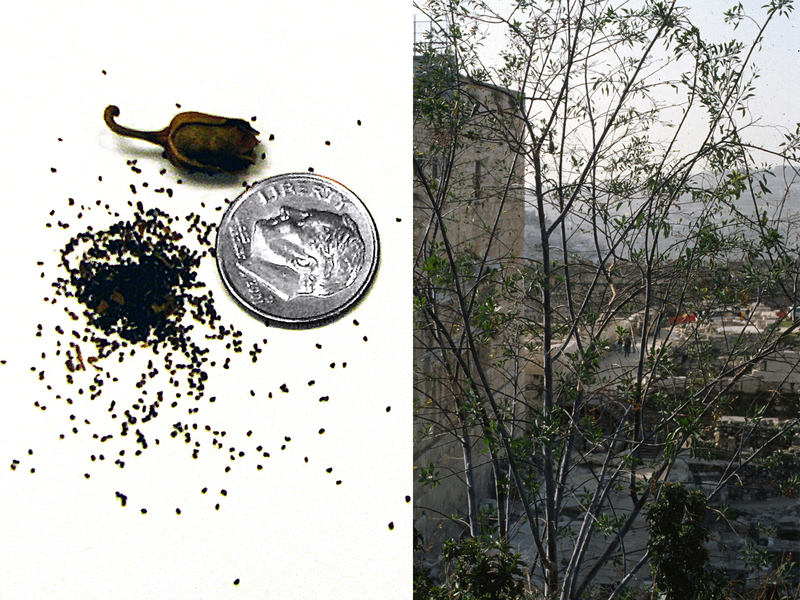 Though the mustard seed is very small, it can grow into a tree where birds can dwell and find protection in its branches. When the Church was restored in 1830, it was like a tiny mustard seed. Since then it has grown until its “branches” are found in almost every nation on earth, and its members find in them a spiritual “home” and protection from the world. The Savior used the parable of the mustard seed to teach that His Church would grow from a small beginning into a very large organization (compare Daniel 2:44; D&C 65:1–2).
. Right: A mustard tree. President Wilford Woodruff (1807–98) recalled the words of the Prophet Joseph Smith to brethren gathered in a priesthood meeting in Kirtland, Ohio, in April 1834: “The Prophet said, ‘Brethren, … I want to say to you before the Lord, that you know no more concerning the destinies of this Church and kingdom than a babe upon its mother’s lap. You don’t comprehend it.’ I was rather surprised. He said, ‘It is only a little handful of Priesthood you see here tonight, but this Church will fill North and South America﻿—it will fill the world’” ( Teachings of Presidents of the Church: Joseph Smith , 137). Matthew wrote that the Savior’s parables fulfilled prophecy (see Psalm 78:2–3) by revealing truths that had “been kept secret from the foundation of the world” (Matthew 13:35). President Russell M. Nelson taught that the Lord continues to reveal such truths in our day: “The Lord had long planned to reveal ‘things which have been kept secret from the foundation of the world’ [Matthew 13:35]. Those things included revelations recorded in the Book of Mormon [see 2 Nephi 27:10]. They also included ordinances and covenants of the holy temple [see D&C 124:40–41]. To the Prophet Joseph Smith the Lord declared that ‘I deign to reveal unto my church things which have been kept hid from before the foundation of the world, things that pertain to the dispensation of the fulness of times’ [D&C 124:41]” (“How Firm Our Foundation,” Ensign, May 2002, 76). The parables of the hidden treasure and the pearl of great price have several details in common. In each, a man sold all that he had to purchase the valued item﻿—a treasure and a pearl. In each instance the valued item represents the gospel of Jesus Christ. Placing these parables back to back gives emphasis to the great value of the gospel of Jesus Christ. One difference in these two parables is the manner in which the treasure and pearl are found. The treasure in the field appears to be found accidentally, while the merchant man was actively seeking for pearls. This illustrates that no matter how we find the gospel of Jesus Christ, whether seemingly by accident or through purposeful searching, it is worth sacrificing everything we have to obtain it. Why were the inhabitants of Nazareth, where Jesus had been raised, astonished at His teachings? How do you think the reaction of these people related to the Savior’s decision not to perform “many mighty works there”? Matthew 13:55–56 provides the most detailed list in the four Gospels of Jesus Christ’s family members. From these verses it appears that following the birth of Jesus Christ, Joseph and Mary had at least six children: James, Joses, Simon, Judas, and more than one daughter. James was later called to the apostleship (see Galatians 1:19). Many people have surmised that the omission of Joseph’s name in these verses implies he had already died. For insights on the death of John the Baptist, see the commentary for Mark 6:14–29. Though Matthew did not say why Jesus Christ departed to a solitary place, one possible reason may be that He went to privately mourn the death of John the Baptist (see Matthew 14:13). Despite His desire to be alone, when He saw the multitudes seeking Him, His reaction was not resentment or annoyance, but compassion. The writers of the Gospels repeatedly mention the Savior’s compassion. President Thomas S. Monson spoke of the Savior’s great compassion: “He brought reality to the word compassion. He showed us the way. He marked the path we should follow. Selfless service characterized His life. … The Savior’s entire ministry exemplified love of neighbor” (“The Way of the Master,” Ensign, May 1996, 51). To learn more about the miracle of feeding the “five thousand men, beside women and children,” see the commentaries for Mark 6:32–44 and for John 6:15. The early Apostles journeyed across the Sea of Galilee in a small fishing boat. “I know that [the Lord’s] tender mercies and His miracles, large and small, are real. They come in His way and on His timetable. Sometimes it is not until we have reached our extremity. Jesus’s disciples on the Sea of Galilee had to toil in rowing against a contrary wind all through the night before Jesus finally came to their aid. He did not come until the ‘fourth watch,’ meaning near dawn. Yet He did come. (See Mark 6:45–51.) My testimony is that miracles do come, though sometimes not until the fourth watch” (“My Soul Delighteth in the Things of the Lord,” Ensign or Liahona, May 2008, 83). “This scriptural account reminds us that the first step in coming to Christ﻿—or his coming to us﻿—may fill us with something very much like sheer terror. It shouldn’t, but it sometimes does. One of the grand ironies of the gospel is that the very source of help and safety being offered us is the thing from which we may, in our mortal shortsightedness, flee. For whatever the reason, I have seen investigators run from baptism, I have seen elders run from a mission call, I have seen sweethearts run from marriage, and I have seen young couples run from the fear of families and the future. Too often too many of us run from the very things that will bless us and save us and soothe us. Too often we see gospel commitments and commandments as something to be feared and forsaken” (“Come unto Me” [Brigham Young University fireside, Mar. 2, 1997], 8; speeches.byu.edu). “It is my firm belief that if as individual people, as families, communities, and nations, we could, like Peter, fix our eyes on Jesus, we too might walk triumphantly over ‘the swelling waves of disbelief’ and remain ‘unterrified amid the rising winds of doubt.’ But if we turn away our eyes from him in whom we must believe, as it is so easy to do and the world is so much tempted to do, if we look to the power and fury of those terrible and destructive elements around us rather than to him who can help and save us, then we shall inevitably sink in a sea of conflict and sorrow and despair. “At such times when we feel the floods are threatening to drown us and the deep is going to swallow up the tossed vessel of our faith, I pray we may always hear amid the storm and the darkness that sweet utterance of the Savior of the world: ‘Be of good cheer; it is I; be not afraid.’ (Matt. 14:27. )” (“The Beacon in the Harbor of Peace,” Ensign, Nov. 1992, 19). “When [Peter] began to pay more attention to what was happening around him, ‘the wind boisterous,’ he began to sink. What are the winds boisterous in our lives? What are the things that distract us from the Savior, that turn our hearts and our minds away from Him? It may be thinking more about pleasing our friends or other people than we do about pleasing God (see John 5:44). It may be the loud and confusing voices we hear on TV, in videos, in music. Sometimes we just don’t care. Our hearts are hard (see John 12:37). There will always be distractions, winds boisterous, but if we choose to turn to the Lord, to believe in Him, to follow Him, we can increase our faith. “When Peter began to sink, he turned to the Lord and cried out, ‘Lord, save me,’ and Jesus immediately ‘stretched forth his hand, and caught him.’ He will do that for you. He will do that for each one of us [Matthew 14:30–31]” (“Increase in Faith,” Ensign, May 1994, 95). For help understanding the dispute about unwashed hands, see the commentary for Mark 7:1–13. “Jesus’ challenge shows that the conversion He required for those who would enter the kingdom of heaven (see Matt. 18:3) was far more than just being converted to testify to the truthfulness of the gospel. To testify is to know and to declare. The gospel challenges us to be ‘converted,’ which requires us to do and to become” (“The Challenge to Become,” Ensign, Nov. 2000, 32–33). At a time when the gospel was being proclaimed to the Jews and not yet to the Gentiles, a Gentile woman recognized Jesus as the “Son of David,” the promised Messiah. The Greek word translated “dogs” referred to small dogs that could be household pets. Such pets would eat morsels of food given to them from the table or carelessly dropped. Understanding the Savior’s distinction between Israel and Gentiles, the woman correctly pointed out that household pets were allowed to eat that which had been rejected. She did not take offense at Jesus’s words, but she humbly recognized that she was a beggar at Israel’s table. The Savior commended her expression of faith. This account is part of a theme in the Gospel of Matthew concerning the Lord’s plan to take the gospel to the Gentiles. Though a Gentile, the woman had great faith, yet the disciples asked Jesus to send her away. Instead, Jesus ministered to her. When the time came for the disciples to carry the gospel to the Gentiles (see Matthew 28:19–20), they could expect to find many individuals who, like this woman, were ready to receive their message. For information on the miracle of feeding the “four thousand men, beside women and children,” see the commentary for Mark 8:1–9. What can you do to cultivate the spiritual “soil” of your heart to eliminate impediments to spiritual growth and productivity? Considering that the parables of the hidden treasure and the pearl of great price teach that the gospel is worth everything we have (see Matthew 13:44–46), what sacrifices have you or those you know made for the gospel? How well are you keeping your focus on the Lord Jesus Christ rather than on the winds and waves of life? (see Matthew 14:30). How does keeping Him in the forefront of your life help you overcome the challenges of daily living? Write a brief description of how the four soils described in the parable of the sower are similar to the different groups of people in Lehi’s vision of the tree of life (see 1 Nephi 8:21–23, 24–28, 30, 31–33). Make a list of “thorns” (see Matthew 13:22) that you see affecting the testimonies of young single adults in the Church. How can choosing to keep God’s commandments and to follow Church standards help you avoid being choked out by these thorns? Imagine yourself as a participant in the events of Matthew 14:25–33. Then write a journal entry describing your experience that night.